The weather is cooling down quickly and with some good football games to watch this weekend, it was time to make a simple “hands free” recipe and relax. I’ve previously posted a recipe for Nonna’s Short Ribs, but that was a tomato based sauce that is cooked on the stove top and pairs better over mashed potatoes or pasta. This recipe incorporates essentially no tomato and is meant to be meatier and served over risotto! As you prepare the vegetables, have the ribs coming to room temperature. In a heavy, oven safe pot, saute the veggies and garlic in a bit of olive oil until they begin to soften. Dust the ribs lightly with flour, push the veggies to the side of the pot and brown the ribs well. About 2 minutes per side on medium heat. Add a bit more oil if necessary to keep the veggies from burning. Remove the meat from the pot and deglaze with the red wine. Scrape the bottom of the pot well. That’s flavor! Return the meat to the pot, add the beef stock, cover and put into a 325 degree oven for 3 hours. Check occasionally to make sure there’s still liquid in the pot – there should be. And don’t touch the ribs! At the 3 hour mark, uncover the pot and cook 20-30 minutes more so that the sauce concentrates. Remove the ribs to a plate to keep warm. Add a teaspoon or two of tomato paste to thicken the sauce if necessary. 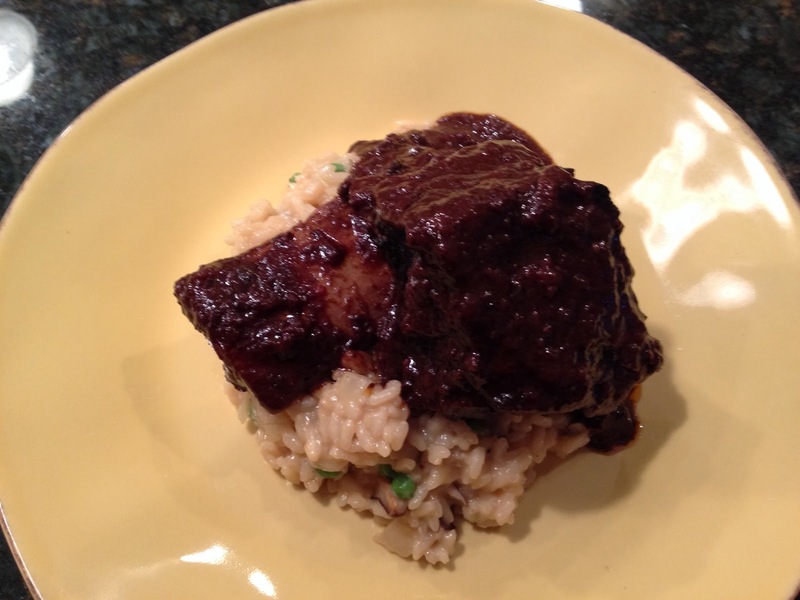 Then plate your simple parmigiano risotto onto warmed plates, add a Short Rib to the top of the risotto and drizzle with the sauce. There is not a more friendly match for red wine. 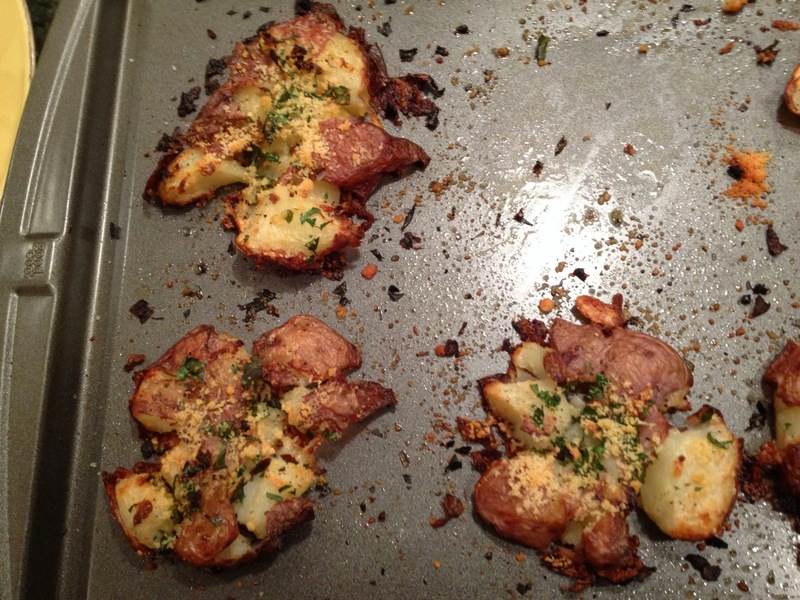 Also this weekend I made a simple side dish that I call “Car Crash Potatoes”. Why? Because it looks like these things were subjected to some sort of frontal impact. I lifted this recipe from Facebook, but it’s so good, and something different to do with potatoes, that I’m including it here. This is so easy. Boil the potatoes until they are fork tender. Remove and let cool for 10 minutes or so. Arrange the potatoes on a cookie sheet. Using a potato masher, gently press each potato so that they crush and look like deformed cookie dough. Then drizzle each potato with extra virgin olive oil, season with salt and pepper, and top with the parsley and a generous sprinkle of parmigiano reggiano. Bake at 450 degrees for 15 minutes. Two Important Notes: Do not use small, but regular sized potatoes. They are way too big once you flatten them – they spread like cookies. Get the baby potatoes. And a word on cooking. The original recipe said to bake them for 20 minutes. I used the convection feature on my oven which cuts the cooking time by 20% so I went with 15 minutes. The results were perfect. These are crusty on the outside and soft in the middle with tons of flavor.